I coedited this anthology of writing from the dynamic and pressured Downtown Eastside with John Asfour. It was nominated for a City of Vancouver Book Award and is an important marker in the history of this dynamic neighbourhood as it deals with gentrification and pressures of the modern urban environment. The print book was released in April 2012 and entered its second printing in September 2012. It was shortlisted for the City of Vancouver Book award and has appeared on several course curricula throughout Canada in literature and sociology courses. For course work, university classes, or more information please contact Arsenal Pulp Press here. To purchase, contact any book store, including Pulp Fiction Books, which can ship it ASAP. We donate sales of the book with partial proceeds going to Thursdays Writing Collective. It is available in the US and internationally as an e-book. V6A is the postal code prefix for Vancouver’s Downtown Eastside, an area challenged by poverty-related issues and maligned as “the poorest postal code in Canada.” But the Downtown Eastside (DTES) is also beloved by residents for its optimism, community ties and heterogeneity. V6A: Writing from Vancouver’s Downtown Eastside is an anthology of creative writing by 32 people who have been a part of the DTES community in some way, at some point in their lives. Published by Arsenal Pulp Press, this map of a moment in the DTES’ creative life reappropriates the code and allows a community to define itself, on its own terms. Contributors include: John Barry, Elisabeth Buchanan, Wayde Compton, Henry Doyle, Daggar Earnshaw, Albert Flett, Patrick Foley, Angela Gallant, Gary Geddes, Anne Hopkinson, Jonina Kirton, Don Larson, Gisele LeMire, Robyn Livingstone, Stephen Lytton, Don Macdonald, Muriel Marjorie, My Name is Scot, Lora McElhinney, James McLean, Brenda Prince, Antonette Rea, Rachel Rose, Sen Yi, Irit Shimrat, Kevin Spenst, Loren Stewart, Madeleine Thien, Michael Turner, Phoenix Winter, Cathleen With, Elaine Woo and Daniel Zomparelli. While many participants of Thursdays Writing Collective are published in V6A, the anthology is not a product of the writing program. The British Columbian Journal published this review by John Belshaw in no. 176, Winter 2012/13. The website Vancouver is Awesome recommended V6A as a holiday read Monday, December 3, 2012. Thank you to the hosts of Wax Poetic, Pam Bentley and RC Kowslowski, for having Elee, My Name is Scot and Antonette Rea on their Nov 14, 2012, 2-2:30pm show. Vancouver Weekly reviews V6A here. Posted Oct 15, 2012. We’re excited that the website is expanding it’s creative writing section! Thanks to University of British Columbia’s Arts Report on CiTR 101.9fm for this interview on Aug 22,2012, 5pm about Thursdays Writing Collective’s participation in the Summer Dreams Festival Aug 25, 2012. The podcast is available here. CBC Radio International’s Rufo Valencia did this piece on V6A in Spanish. Includes an audio clip interview with Elee Kraljii Gardiner and a Spanish translation of Brenda Prince’s poem Dance Lightly. Posted July 29, 2012. The journal BC Studies reviewed V6A here in an excellent, intelligent consideration of the book and what it means to the province. July 2012. The urban issues website Spacing inaugurates a new feature on its Vancouver site: “Writing Vancouver” with biweekly excerpts from V6A beginning June 15, 2012. The section invites other DTES writers to contribute their writing to the blog. We’re happy to have had a role in establishing another venue for DTES writing! So far pieces by Rachel Rose, Madeleine Thien and Albert Flett have been posted. An excellent article with excerpts from V6A is on TheTyee.ca from June 15, 2012. June 4, 2012: V6A contributor Don Larson continued his serialized interviews on Coop Radio 102.7fm with guests Sen Yi, John Barry and Patrick Foley. Main and Hastings Show. On May 21, 2012 V6A contributor Don Larson continued his serialized interviews on Coop Radio 102.7fm with guests Anne Hopkinson and Antonette Rea. Main and Hastings Show. A review of V6A appears here May 7, 2012, on the website of Spacing Vancouver, a site concerned with urban space and mapping. Contributor Phoenix Winter wrote this piece on the Downtown Eastside Neighbourhood Council site on April 30, 2012! Henry Doyle, Jonina Kirton and Rockin’ Robyn Livingstone on Coop Radio 102.7fm in Vancouver discuss V6A with contributor Don Larson on his one hour radio show, “Main and Hastings” April 23, 2012. CBC radio’s Ariel Fournier speaks with host Sheryl Mackay about Thursdays Writing Collective on North By Northwest, Saturday, April 21st, 7:30am. Ariel wrote with us last week and made this short doc which includes interviews with Muriel, Henry, John and Elee. On Monday April 16, 2012 contributors Jonina Kirton, Stephen Lytton, Don Larson talked with Gunargie O’Connell on Vancouver Coop Radio’s “When the Spirit Whispers” from 1:20-2:30pm. Gunargie led an interesting and heartfelt discussion about the impact of Residential Schools and abuse on First Nations and Metis people. Arsenal Pulp Press blogged about the launch at their site Arsenalia. rabble.ca picked up and published Megaphone’s cover article on V6A on April 12, 2012. So did Art Threat on April 15, 2012! On Thursday April 12, 2012 contributor Irit Shimrat and coeditor Elee Kraljii Gardiner were guests on CBC’s On the Coast with Stephen Quinn. We will post the audio link here as soon as it is available! On Monday, April 9, 2012 Elee Kraljii Gardiner and Lora McElhinney will join V6A contributor Don Larson on his 102.7 Coop Radio show “Main and Hastings” at 4pm. An article on V6A appears in the April 6, 2012 print and online Vancouver Courier. 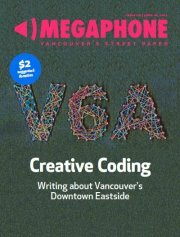 Megaphone, Vancouver’s street magazine did a cover story on V6A with interviews with Henry Doyle, Michael Turner, Cathleen With and Madeleine Thien. Here is the cover!